It’s sagging, forgotten – abandoned curbside like a D-list celebrity desperate for another chance at the spotlight. The free sofa. Granted, the draw toward these enfeebled former centrepieces is considerable. 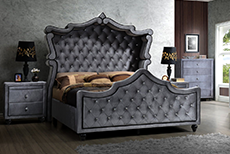 Why spend time bogged down searching through scores of overpriced luxury sofas online? Why trudge through big lots sofas on sale on a Saturday? After all, in the search for affordable sofas, it doesn’t get any better than free, right? You are making a major investment. Your sofa is arguably the most visible piece of furniture in your home and as such, it’s worth it to take a bit more time making a wise choice. The difference between a couch and a sofa lies in dialect. Known as a sofa in Canada and a couch in America, the forerunner of all sofa types dates back as far as the 1600’s. In fact, one of the first designs was originally commissioned by the 4th Earl of Chesterfield. His deep buttoned, quilted leather concept was so popular that older generations still refer to any kind of living room seating as a ‘Chesterfield’. Comfortable yet imposing, it’s still in use today. Of course, new designs are always on the horizon, changing alongside of our attitudes toward home and family life. Your first consideration when choosing the right living room furniture sofa should be the frame. Obviously the cheaper it is, the less solid it will be. You may want to consider the more sturdily constructed kiln dried hardwood framed units. This process thoroughly removes moisture, making the ‘skeleton’ stable in the long run. If you have a household of toddlers or sloppy canines, spending the extra on a fortified frame is a wise decision. The overall ‘feel’ of your sofa is personal. In the same way that some enjoy a firm mattress as opposed to a cushy one, some prefer a more supportive couch. The best way to test this is to take your chosen sofa for a test run. Of course, this does not mean grabbing a bag of ripple chips and binge-watching Netflix in a showroom somewhere. It means a subtle recreation of your usual ‘sofa routine’. Take off your shoes, recline, stretch out…do what you need to do in order to see how it will perform at home. Of course, not all of us have the time to bounce about on couches all day! If you’re one of the millions of time depleted but style savvy consumers out there, there’s no better place to find your ideal living room set than at www.1StopBedrooms.com/living-room-furniture/sofas. With over 15 years of experience, the folks at 1StopBedrooms.com have crafted a future forward shopping experience unlike any other. Customer service is their main priority. You will be pampered from the first moment you log into their site right up to their exceptional white glove set up service nationwide. Free delivery, superior quality, effortless returns and a constantly updated inventory means that you are not only cutting out ‘the middle man’ and enjoying warehouse pricing, but you can be assured that your investment will be in top form for years to come. Seeing that the average person spends up to 13 hours a week on their couch, isn’t it time you checked out www.1StopBedrooms.com and took your comfort seriously? Leave the threadbare cast offs to the college kids!